When did you first learn Baybayin? During my high school days, as I was reading what purportedly were copies of the original manuscripts of a few poems written by the Philippine national hero, Dr. Jose P. Rizal, I would notice some characters inscribed below each of the poem, and I couldn’t figure them out at the time. It turned out, after asking around, that those characters spelled out Rizal’s name in the Baybayin script. That experience started my fascination with this wonderful writing system. What types of materials were available when you went to high school? Were there dedicated textbooks for Baybayin or were they just a few pages in history books with reproductions from late 1800’s to 1930’s? At the heels of my new found passion for learning more about Baybayin, I went to my Dad who I knew was an avid exponent of the Philippine cultural heritage and asked him for materials on Baybayin. He pulled out a book from his Filipiniana collection entitled “Salitikan ng Wikang Pambansa” printed in 1940 and written by Aurelio Alvero, a fierce nationalist scholar who published many subversive articles using the pseudonym Magtanggol Asa during the Japanese occupation of the Philippines (he was later executed by the Japanese). This book was actually a manual on the Baybayin—very well presented and gave me a good handle on the different characters of the script and how they are used. It was also during my high school days that my Dad started taking me along with him to the house of the Philippine national artist in sculpture, Guillermo Tolentino. Mang Emong, as I called him, was not only an accomplished sculptor but also the president of the Union Espiritista Cristiana de Filipinos at the time. This is a society of spiritual healers, mediums, and believers in other-wordly realities. Mang Emong was well versed in Baybayin and in fact produced several texts on this writing system, including “Baybayin, a Syllabary” and “Bathala and Our Baybayin,” both appearing in 1972. He was the one who initiated me into the spiritual aspects of Baybayin. I remember him saying that the script being predominantly rooted in the vowel “a” points to its soul-infused attribute because “a” is the vowel that resonates with the energy of the heart. When did the idea of the book come about? I didn’t plan on publishing a Baybayin manual. The idea for this manual was an offshoot of a course on Baybayin that I taught in 1979 in San Diego where I stayed initially as a Fulbright scholar completing my Master of Arts degree in music composition at the University of La Jolla. The course was under the auspices of the Pilipino Cultural Resource Center of San Diego of which I was the main consultant. I had accumulated a lot of materials for this course, and these all ended up in the book that I eventually published. What was the reaction when you 1st taught the script in 1979? What kind of materials did you have? There are still not that many materials out there besides what’s on the internet. As I stated in my responses to your earlier questions, I was already steeped in the essence and mechanics of Baybayin back in my high school days. I should also mention that since those days my research and studies on the script had not abated, scouring libraries and museums for any extant documents on the subject. At the Philippine National Library, I found a rich trove of Baybayin materials, to name a few, “Los Itas—with samples of Ancient Filipino writings,” 1890, by D.P. Paterno; “Los Antiguos Alfabetos de Filipinas,” 1862, by Emilio Wenceslao and Gamboa Retana; “La Antigua Escretura Filipina,” 1922, by Ignacio Villamor; “Doctrina Cristiana,” 1593, by S. Gabriel; “Ensayo de Gramatica Hispano-Tagala,” 1878, by Toribio Minguella; and many others. My own uncle, Ricardo Mendoza, published in 1972 a book entitled “Pinadaling Pag-aaral ng Katutubong Abakadang Pilipino,” where he argued passionately for incorporation into the Philippine schools’ curriculum of a course on the ancient script. It was in this book that ideas for expanding the Baybayin characters to allow for other orthographic systems were first laid down. I would later seize on this and take it much farther. Was Baybayin ever considered artwork before or is it just recently? In a strict sense, the Baybayin characters as materials for artwork did not jell in the consciousness of Filipino artists until around 20 years ago, and largely involving the younger generation. There were sporadic expressions of interest in the Baybayin as an art source at an earlier period but only confined to the literal use of its characters, not as motifs for creative designs. Examples are the university seal of the Far Eastern University of Manila where the fonts used were patterned after the Baybayin script, the logo of the Cultural Center of the Philippines designed by national artist for visual arts, Carlos “Botong” Francisco, that incorporated three representations of the Baybayin character “Ka” to stand for Katotohanan (Truth), Kagandahan (Beauty), and Kabutihan (Goodness); and the sash in the academic regalia of the University of the Philippines joined in front by an ornament and embroidered with the university’s initials in Baybayin. In a larger sense, however, the ornate properties of the Baybayin script have always been part and parcel of Filipino aesthetics. Their curvilinear, arabesque patterns evolve from the spirit of Okir (root word of the Tagalog word for carving, ukit) that permeates Philippine architecture, crafts, implements, costumes, and other aspects of the national life. Okir is also said to signify the hidden force that shapes events and brings people’s lives together. Viewed through this lens, Baybayin can be said to have been intertwined closely with Philippine art throughout the people’s history. How involved are you with Baybayin now? Do you still write and/or teach it? Up until 1999, I’ve been actively teaching courses and conducting workshops on Baybayin under the auspices of various organizations such as the Paaralang Pilipino Foundation, the Alay Performing Arts, Amauan Workshop, and U.P. Alumni and Friends. From these courses and workshops, I’ve accumulated a great deal of additional materials on how best the knowledge and practice of the script can be transmitted. I’ve also acquired more research that I believe will come in handy when I work on the second edition of my Baybayin manual. When will your 2nd edition of the book come out? I plan to work on it this summer, so it should be ready for release probably by September or October at the latest. With more and more people using technology to learn, are you planning to distribute your materials via the internet or social media? I think both digital and print distribution of my work will be the way to go these days. What’s your opinion on the proposed National Script Act of 2011, where Baybayin would become “official”? Do you think it’s premature since it’s not even standardized? The resurgence of appreciation for the indigenous and folk heritage of the Philippines actually happened in the 1970s but has only started maturing in the last 10 years. I believe the national condition needed for championing the revival of Baybayin has arrived, but the effort should be taken slowly. It should be aimed to coalesce around targeted key groups that will have strong influence on its successful adoption and implementation. I don’t think there should be a rush to “inscribe Baybayin in all products locally produced or processed in the Philippines, and to include Baybayin translations on the labels of processed or food products.” The place to start is in the curriculum of elementary and secondary education. We don’t have to worry about there being no standard Baybayin version. We can start with any version and incorporate modifications as needed later in the process. This is how it was done during the selection process conducted by the National Language Institute of the Philippines for the regional dialect that would become the basis of the Philippine national language. Tagalog was the one chosen and into which words from other dialects have since been incorporated from time to time. What’s the 1st thing someone should do if they want to learn Baybayin? In talking to people, not knowing a Filipino language is a big concern. In your opinion, is there a workaround? I’ve found the approach that I have taken in my manual to be effective in giving beginners a practical knowledge of the script. I’ve taught several courses using this manual and in a matter of weeks, people in my classes could navigate the contours, structure, and application of the script pretty well. It’s no different than learning, say, Spanish. One doesn’t need to know the Spanish language before learning how to use Roman characters in writing Spanish words. You learn the language as you learn how to write it. What will be problematic is if one attempts to apply the strict orthography of the Filipino language to words from other languages such as English, French, German, etc. This simply cannot be done unless one really knows Filipino, and even then it is not practical. For example, the orthographically correct word “blu” in Filipino for the English “blue” and “blew,” and for the French “bleu” will be impossible for the Filipino reader to ascertain which foreign word it is intended for. The same goes for “knight” and “night”, which when written as “nayt” according to Filipino orthography is lost in ambiguity. This problem gets compounded when one tries to use the script while imposing the native orthography on other languages that have many silent consonants. This is the reason why I created new characters that are essentially derived from the original Baybayin glyphs and argued for using the expanded set to transcribe words in any foreign language as they are spelled, not as they are spoken. Spelling and pronunciation need to be divorced if we are to succeed in adapting Baybayin to other languages. Let’s not get caught in the counter-productive argument between the so-called purists (strict adherents of the original 17 Baybayin characters) and the modernists who are open to updating the script for universal application. We’re in a global age that should transcend ethnicity. It seem like most of the people who are in to Baybayin now are Fil-ams. Do you think that’s an accurate statement? This is only normal. Throughout my stay in the U.S. working with a lot of young Filipino Americans, I’ve found in them a great yearning and hunger for their cultural roots that span the whole gamut from folk and indigenous arts, traditional literature and music, to tattoos and the ancient script. This is part of the process of cultural awakening as more and more people of Filipino ancestry begin to shed their colonial trappings. Most people are introduced to the script as “Alibata”. What’s your opinion of the usage of the term? I have no problem with using either Baybayin or Alibata—one is of Northern extraction, and the other, Southern. It’s pretty similar to the variations of certain words such as the term for the native bamboo buzzer, which is “bunkaka” in the south, and “barimbaw” in the north. Or the term for the native Jaw’s harp, which is “kubing” in the south, and “kuribaw” in the north. I’ve read comments that Baybayin shouldn’t be the name of the script because it’s just another form of Tagalogization. Is it? I deplore these comments because I see them as manifestations of an ancient, tenacious social disease known by many names such as regionalism, ethnocentrism, factionalism, and tribalism. This disease has been especially deadly and responsible for terrible conflicts and wars that have plagued this planet for a long time. What does it matter which region or enclave or community the name came from? To view a name as a threat to one’s regional identity can only come from an unfortunate narrow-mindedness that we don’t need. This has nothing to do with Baybayin but do you think we should change the name of the country? What we identify with as Filipino today is essentially a product of two major cultural streams—Asian and Spanish. The name “Filipinas” only highlights the Spanish part. Perhaps a name can be found to embody both streams. But this can only happen when Filipinos as a people have crystallized a national consciousness, something that I don’t foresee happening until probably at least a hundred years from now. Thank you for taking part of this interview. I learned a lot and look forward to the 2nd edition of your manual. Any last words or anything you want to promote? I think allowing me to convey to a web audience significant elements of my Baybayin quest and to express my views on related topics has been a joyful and rewarding process for me. I deeply appreciate your conducting this interview. With young people like you continuing to blaze the path toward the rediscovery and renewal of our rich Philippine cultural heritage, I have high hopes that Filipinos as a people will one day be able to truly reclaim their national soul. This entry was posted in Articles and tagged Bayani Mendoza de Leon, interview. Bookmark the permalink. “Let’s not get caught in the counter-productive argument between the so-called purists (strict adherents of the original 17 Baybayin characters) and the modernists who are open to updating the script for universal application.” –amen, Manong Bayani, amen. Thank you for interviewing Bayani Mendoza de Leon. Long before the internet had helped baybayin become popular among Fil-Ams Bayani had learned and taught about baybayin and published the book, “Baybayin, the Ancient Script of the Philippines: A Concise Manual” that many people think is out of print but is in fact still available from Philippine Expressions bookstore. Just a footnote, his father was Felipe Padilla de Leon, an accomplished musician, composer, conducter and scholar, and a national artist of the Philippines. Bayani’s mentor was his fathers close friend, Guillermo Tolentino a great sculptor and also a national artist of the Philippines. Bayani’s brother is Felipe M. de Leon, Jr. a professor of Art Studies at U.P. Diliman where he has taught, for decades, humanities, arts and is a big influence on decolonization because he exposes students to a lot of indigenous Philippine art and culture. Je was the Chairman of Dept of Humanities and influenced many of the students and older scholars, artists and professors of today. I look forward to Bayani’s web publishings on baybayin. Wonderful interview, Christian. Thank you for giving this man some well-deserved recognition at baybayin.com. I came across this article while googling for Bayani De Leon today. I wish to provide another perspective on his background. I knew Bayani DeLeon back in the late 1970’s and early 1980’s when he was a Fulbright Scholar. It was actually at the University of California San Diego, located in La Jolla. I went there also for my undergraduate degree in Biochemistry and Cell Biology. 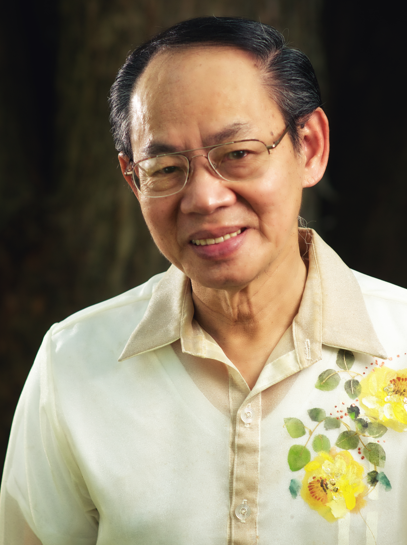 During his time there, he composed Philippine music and conducted the Rondallas of two local Philippine Dance Companies, Pasakat and Samahan dance companies. He was very passionate and dedicated to his work. Members of the rondalla were high school and college students and their parents. He created a ingenious way of writing music on paper, so that we can play without reading actual notes. We played live music during the performances which also included Igorot folk dances with Ganzas. He also produced one of the first Rondalla records ever made outside of the Philippines. I would often see him write characters on paper during his spare time. He said it was Babayin script, but at the time I didn’t pay much attention. I now have new appreciation of this indigenous art form. It was an honor and privilege to have know and worked with Bayani De Leon, he changed the lives of everyone he was in contact with. I’m an American born Filipino whose father was in the military. Until I met Bayani DeLeon, I did not have a sense of my cultural identity. His dedication to the arts and Philippine culture impacted those American born Filipinos in San Diego. I continued my education at the University of California, San Francisco earning a doctorate in pharmacy. And now work as a Clinical Pharmacist at a Medical Facility in the Inland Empire in California, I look back and appreciate how much Bayani De Leon enriched my life. Thank you Bayani De Leon. Roldan A Teroy, Pharm.D. Thank you so much Christian and Bayani for this informative interview. It inspires me to know people who are zestful at preserving and promoting our Philippine cultural heritage, especially now when cultures often intersect – transcending geographical boundaries because of technology. It is easy to get lost without a solid cultural base. Maraming salamat ulit. Congratulations! It is not actually called Alibata because Alibata came from the word “Alifbata” which is a sansrit word. So it should be called Baybayin. Our ancestors named the script that way. Nice Interview with Mr. Bayani Mendoza,..